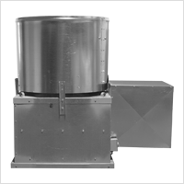 UBRD | S&P Canada Ventilation Products, Inc.
Straight-through air flow design results in maximum exhaust efficiency. During operation, high air flow velocity opens butterfly dampers and prevents rain or snow from entering. Dampers close and cover the venturi opening when unit is not in use. The roof mounted location eliminates interference with processes and equipment inside the building. It also permits locating the exhauster over a source of heated or contaminated air, allowing direct upward venting to the outside, unlike wall mounted exhausters which may move contaminated air through adjacent work spaces. 24 30" 32" 30" 50" 22" 16" 31"
30 36" 38" 36" 54" 22" 16" 37"
36 42" 44" 42" 56" 22" 16" 43"
42 48" 50" 48" 59" 22" 16" 49"
48 54" 56" 54" 68" 22" 22" 55"
54 60" 62" 60" 70" 22" 22" 61"
60 66" 68" 66" 74" 22" 22" 67"
72 80" 82" 80" 86" 22" 22" 81"